Retire the Colors: Veterans & Civilians on Iraq & Afghanistan. Dario DiBattista (Ed). Albany, NY: Hudson Whitman/Excelsior College Press, 2016. Retire the Colors is a reference to the command given at the end of a service or ceremony directing the color guard to retrieve the national and unit colors and remove them from the ceremony. Rendering honors and retiring the colors marks the official end of the ceremony, and frequently, the transition to the informal social activities afterward. The reference is appropriate for this anthology of stories dealing with transition between military service and the civilian world. Edited by Dario DiBattista, these stories are powerful and emotional, so much so that I simultaneously didn’t want to read more and couldn’t put the book down. The first essay, “Numb3rs,” was written by Brooke King, an Army veteran and mother. She relates an experience at a hospital where an older, male veteran asks her how many people she killed as a machine gunner in Iraq. She knows her ‘number;’ really, she has more than one. To give him that number will change his view of her, probably into judgement, if not outright condemnation. In parallel, she tells the story of taking her kids to school and finding a wounded duck in the road. The bird is fatally injured and she knows the humane thing to do is end its misery rather than let it suffer. But her kids are watching from the car, passersby offer bits of not-so-helpful advice, and traffic is backing up behind her. How she deals with that situation, how she answers the ‘numbers’ question, and how the intersection of these two stories changes her number is compelling. “Numb3rs” is an apt lead-in for this book, highlighting several recurring issues that veterans, families, friends, and society deal with after combat. 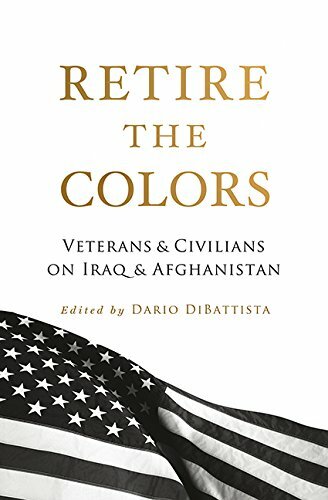 The stories in Retire the Colors are written from many perspectives: men, women, servicemembers, families, care providers, minorities, and even an Iraqi doctor forced to flee her country after being wounded. The book is divided into three sections: War, Up Close is written by veterans about their experiences and transition after leaving the service. War, Beyond the Warriors is written from the perspective of family members and care providers. War, and What Follows is written mainly by veterans and addresses the resolution of their conflicts and struggles with reintegration. “What We Couldn’t Do for our Grandfathers,” by Melissa Walker, typifies the second section and illustrates how the trauma of combat affects not only veterans, but also the people around them. Walker opens with recollections of her grandfather waking from a nightmare, cursing, and “like so many veterans of our current wars...[spending] the remainder of his days living out a speechless terror.” As an adult, a graduate class on the psychology of trauma made the connection between her grandfather and post-traumatic stress disorder. Later, as an art therapist in a military hospital, her perspective on the human condition changed through her interaction with patients in art, poetry, writing, and even tattoos. She observes the “fine line we all walk between sanity and insanity” and that “our problem with mental health, as a nation, does not start with war.” Through her position, she is able to shape and influence non-traditional paths to care, experiences growth in her own life, and finds joy and satisfaction in helping veterans in ways that could not be done for our grandfathers. In Part 3, War, and What Comes After, Colin D. Halloran’s “Private. Pupil. Professor.” recounts his conflicts in academia and his experience with the civil-military divide. After a vignette of pointing out to his students mid-semester that they’ve had a veteran with PTSD in the room all along (him), Halloran proceeds to unpack his personal story and battles with academia. In his first semester of college, his National Guard unit is alerted for deployment to Afghanistan. When the semester ends and deployment is imminent, he finds his Diversity and Inequality professor, a veteran, has failed him for excessive absences due to military training. The grade is ultimately changed to a B, but Halloran has learned his first lesson: as a veteran, he “is in a minority. And shunned because of it.” After being medically evacuated from Afghanistan, he returns to college with a cane, is mocked by other students and struggles to reconcile his military work ethic with 18 year olds interested in frat parties and sneaking alcohol into the dorms. As a student, and later a professor, he concludes that his students lack information vital to their understanding of society, and not just an understanding of war; they don’t even know what questions to ask. As a professor, he struggles to find tenure and employment, wondering if it is his disability, his veteran status, or if statements about hiring veterans are just lip service. Halloran’s enduring response is to take pride in his role as a veteran in academia, despite the challenges and occasional hostility. 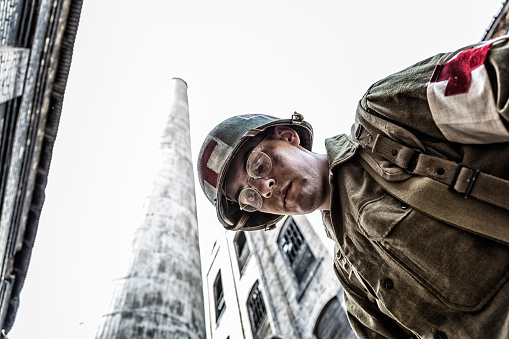 Several themes emerge throughout the book: a number of stories are by explosives ordnance disposal technicians, whose experiences are among the most traumatic and violent. Several, including “Numb3rs” and “Grandfathers” are written by women, including two professionals involved in providing care to veterans. The concept of moral injury surfaces more than once. A moral injury occurs when a person transgresses core human values, causing feelings of shame, guilt, and self-destructive behavior. Running as a means to catharsis and healing is another motif. Several stories address the common question—did you ever kill someone?—and how a veteran might answer. A veteran who has likely doesn’t want to talk about it; a veteran hasn’t may fear being considered less worthy for their negative answer. And there’s the ubiquitous, well-intentioned but hollow, "Thank you for your service.’’ Is it offered sincerely? Is there an understanding of what the veteran’s service was? How might a veteran respond in a way that acknowledges good intentions and helps to understand that service? In the editor’s acknowledgements, he states that one of the book’s purposes is to connect “the 99% of America who haven’t served, with the experiences of those who did.” Retire the Colors succeeds with stories like “Private. Pupil. Professor.” and “That Combat Medic & I,” a moving essay written by the girlfriend of a medic who, in his nightmares, triages her as he relives the traumatic injuries and deaths of his comrades. Each story is an example of the author’s purpose, but at the end, I was left wondering how effective the book will be in beyond the veteran community. I suspect many readers will be veterans; these are relevant and even cathartic stories for that community, but are there ways to help the author achieve his purpose beyond that group? I’ve experienced some of the scenarios in the stories. At school events, sports, Scouts, or church, when another parent realizes I’m a veteran, I occasionally feel that click in the conversation. I’ll probably get one of the obligatory surface comments or questions, but I can almost feel the underlying questions or even suspicions. Many probably are genuinely interested, but neither of us knows how to get beyond that initial awkwardness. Desiring to improve a relationship, accepting some discomfort, a book like Retire the Colors can be a transcendent vehicle, joining a canon that runs from recent works such as Incoming: Veteran Writers on Returning Home and The Road Back from Broken to classics such as Coriolanus and The Road Back. Within days of finishing the book, a new friend asked about what I do in the military. With Retire the Colors fresh in my mind, I was encouraged to share more than the cursory explanation. Turns out my friend actually was interested, and beyond our conversation, I could recommend this book to deepen his understanding of veterans’ experiences. Jon Farr is an Army National Guardsman with command and staff experience at various levels. He has deployed to Iraq and Kuwait, holds degrees from Regis University and Wheaton College, and is a recent graduate of the Joint Combined Warfighting School-Hybrid. The opinions expressed are his own and do not reflect the official policy or position of the U.S. Army, Department of Defense, or the U.S. Government. Stewart Moss, “Witnessing their Witness: A Civilian among Warrior Writers” in Retire the Colors, 95. Melissa Walker, “What we Couldn’t Do for Our Grandfathers” in Retire the Colors, 66. Colin D. Halloran, “Private. Pupil. Professor.” in Retire the Colors, 160.